As everyone know, Krispy Kreme is in town!! Good news for all those who fancy doughnuts . So, is that be a good news for me too??? Well, I would say it's a good try! Believe it or not for 20 over years I live my life, this is the first time I finish a whole doughnut! Okay... should be more than 1 doughnut. Thanks to Boolicious on her earlier post "Previewing Kirspy Kreme's Original Glazed Doughnuts" or else I wouldn't be much interested to try. Don't get me wrong! I am not in the queue as I am just passing by while I was on my way to office. Honestly, although I am aware that Krispy Kreme is actually giving away prizes for early birds on the first day but I didn't expect the queue could be so long. Krispy Kreme Doughnuts proved me wrong! They do have lots of fans! A famous international doughnuts stores chain that was initially based only in United States in 1937. 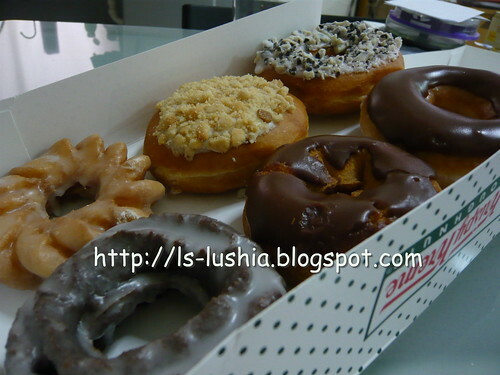 Krispy Kreme Doughnuts is popular with its very own product which is their traditional glazed doughnuts. Over the years, Krispy Kreme spread their wings and successfully landed in other countries. 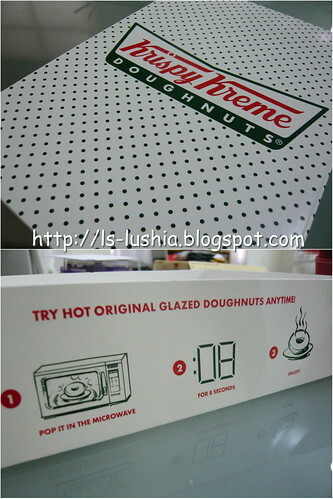 As in Malaysia, Krispy Kreme Doughnuts & Coffee is also brought to us also by Berjaya Corporation. Thanks to my fellow colleagues who helps to me to get 1/2 a dozen of Krispy Kreme's assorted doughnuts for me during lunch time. The original glazed doughnuts are at RM 2.50 each and the assorted doughnuts cost RM 2.80 each. If you would like to try more, perhaps you may go for their dozen deal or double dozen deal which is slightly cheaper. Terrific! The doughnuts are soft and fluffy. Definitely, it's fresh and the glaze... it melts upon the first bite. Serve warm or not.. it's still as good as it is! Freshly baked torus shaped doughnut topped with cookies and creme. The topping tasted more like white chocolate and it's sprinkled over with crusty cookies. Sweet. Chocolate glazed cake. This is the first piece among the 1/2 dozen of doughnut that I chomped off. It's extremely good but extraordinarily sugary. Vanilla cake top coated with chocolate. Not too rich, not too sweet. Just right! One of the different among the six. 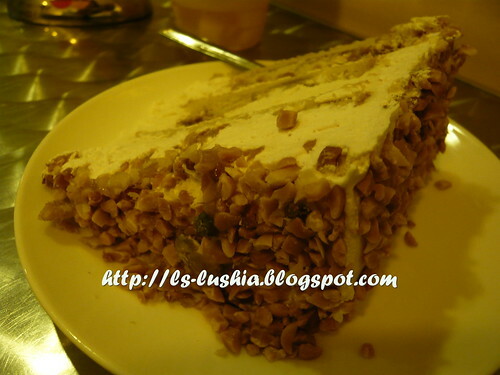 Filled with rich and smooth cream and then topped with cereal coating. Combination of soft and crunchy. Wonderful and pleasing! The great old fashion doughnut top with a coat of rich chocolate icing. 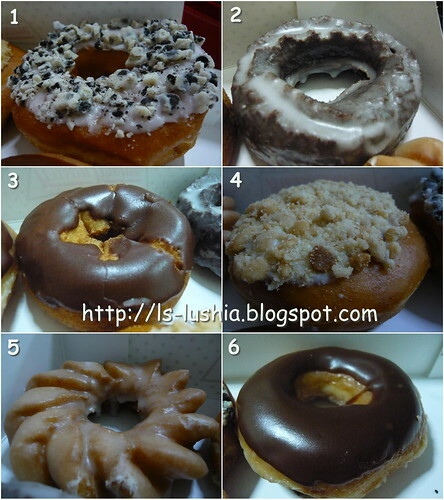 The doughnut itself is good and with the coating, it tasted even better for a chocolate lover like me! No 1, Jalan Imbi,55100 Kuala Lumpur, Malaysia. A Sunday that begins with a perfect breakfast and then continued with a SOUR Tea Time @ WINTER WARMERS, THE Curve!!!! Our first impression towards Winter Warmers Coffee & Tea House was good or else we wouldn't revisit. But, we were totally wrong! The second visit left us with a "NO MORE REVISIT" impression. Why so??? Because......... we were served with stale and rotten food! Double served of everything on the afternoon tea for one menu. For you to enjoy with a friend or someone special: scones, cakes, sandwiches, cookies, fresh seasonal fruits and two steaming pots of original black tea. 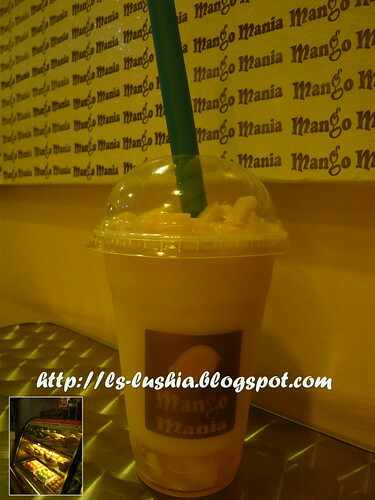 * Add RM 1.00 to change to other beverage. Looks tempting to you?? Okay... yes and no. Well, doesn't matter if it look tempting or not, how about the taste? We both started our tea with the cookies serve on the top layer of the 3 tier food display stand. Mmm... nothing special. Then comes the Tiramisu cake and Lemon Cheese Cake. Cut the Lemon Cheese Cake into half and took a big bite of it and guess what??!!! It stinks like a baby's spitting up after milk feeding. So, I complained to the waiter that the cheesecake taste kinda weird- sourly bitter and smells bad. He goes like... " Ah huh... I will replace it with another piece of cake?" And so he did replace a piece of Caramel Cake to us. Fine............. we weren't that pissed off actually. Munch munch munch... next would be the tuna sandwich. Chomped half of the sandwich and .......(yucksssss) I spitted out! Gross.............It's fishy, bitter and sour tasting. And I felt some stinging and prickling sensation in my mouth and my throat goes very dry!! Initially, I told Jessie to try some but then told her not to! Me : Hey, the tuna sandwich taste weird and it stinks! Him: Oh.. your tongue, can you feel the stinging sensation? Him: Must be the tuna....it's contaminated. Me : Huh???? You know the tuna is rotten and still serves it to you customer? Me : (Smile) No thanks! A MESSAGE TO THE BUSINESS OPERATOR- I know you are doing business, trying to make the best profit with lowest cost BUT that doesn't mean you can serve stale, rotten and contaminated food to your customers and put their health to risk! Poor Jessie and me... we are having STOMACH ACHE!!! I know it's not good to condemn Winter Warmers Coffee & Tea House, do look at the brighter side, I am just asking them to improve and don't want the others to be the next victim. What will you do if you were us? I could have wake up early in the morning and prepare breakfast by myself, but I didn't. I find myself drifting far far away from the kitchen nowadays. All because of a lame excuse- I am tired! Being not a constant cook but with an affection towards baking and cooking, my kitchen are quite well equipped. Somehow, I noticed that those equipments are more like displays in the museum now. A beautiful Sunday begins with a pleasant breakfast and so, do enjoy the last day of the week to the fullest! 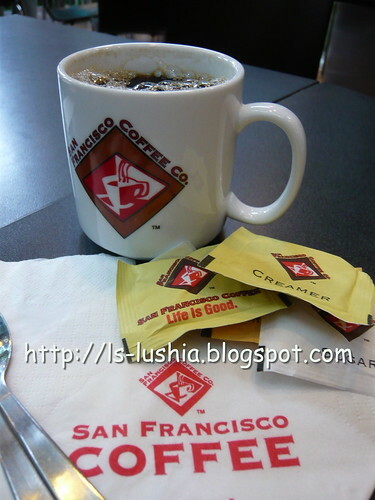 As for this week, my warm Sunday begins with a cup of "Morning blend" coffee by San Francisco Coffee! 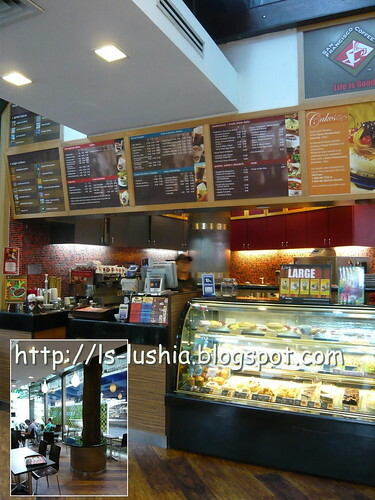 San Francisco Coffee, from a single outlet in year 1997 has expanded to 27 outlets in Malaysia. 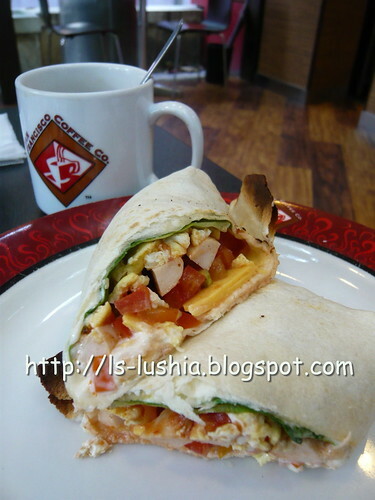 A brand for premium coffee and good food with excellent service! And guess what?? San Francisco coffee offers breakfast set too!! There are about 5-6 types of breakfast sets and each breakfast set comes with a cup of coffee /tea which is refillable until 12 noon (Can you drink that much???). Well, the Omelette Set by San Francisco Coffee is quite appealing. I mean the omelette not the toast or the red beans! 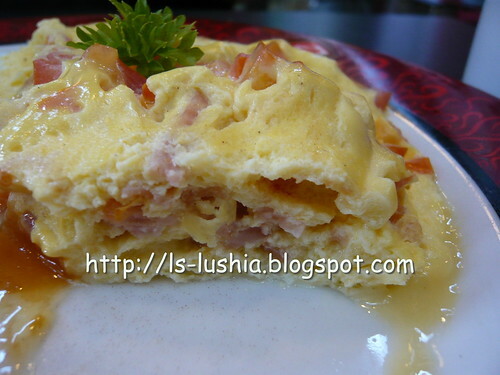 The slightly cheesed omelette with diced tomatoes are prepared with a generous portion of cut hams. Dash some pepper to taste and the result was marvelous! As mentioned earlier, there a a few sets of breakfast offered by San Francisco Coffee. I was looking around and I found the most unattractive breakfast set display among the others which is named as Burito Set! Okay- I ordered Burito Set! 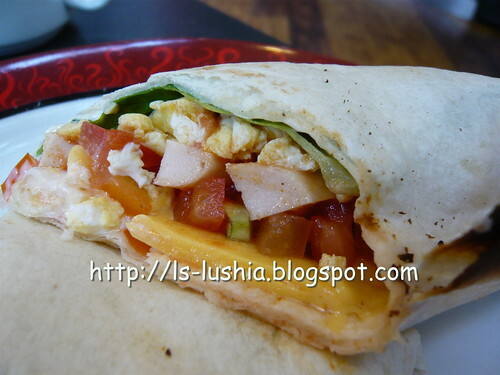 Diced tomatoes, cut sausages, scrambled eggs, mayonnaise and cheese wrapped with tortillas and then grilled before served. Am amused with the grilling idea as the combination of aromatic grilled tortilla with the slightly melted cheese , juicy tomatoes, eggs and sausages was perfect. An awesome breakfast set! And you don't know where to head for breakfast? Consider San Francisco Coffee! Life is Good! A simple byword of San Francisco Coffee! This is the outlet in Lot 10 KL, which I find their breakfast set prepared is appealing. Am not sure about the performance of other outlets as sometimes the taste and service might differ from outlets to outlets. Try your luck! 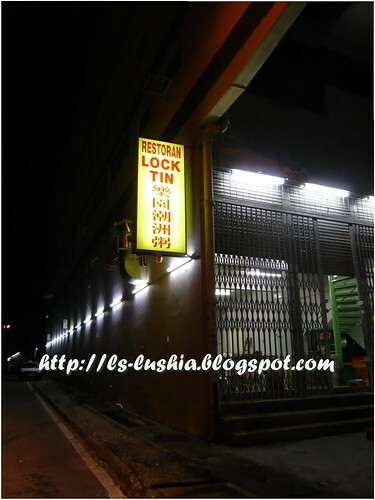 Lock Tin, a teochew porridge restaurant initially operating in a small and humble hut hidden behind a snooker plaza along Old Klang Road has moved to a shop lot across the road! Even the restaurant has moved to a shop lot, somehow the location of the restaurant is still not easy to be spotted. Kinda weird, but still as crowded as before. 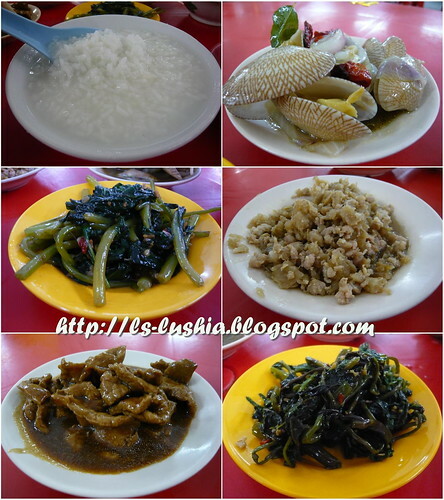 Teochew also known as Chaozou is located is Guangdong China and Teo chew porridge is believed to be one of their cultural dining style. Porridge known as "mui" is the teochew version of rice porridge. Porridge are watery with visible rice grains and normally served with various types of dishes like fish, preserved meats and eggs etc. 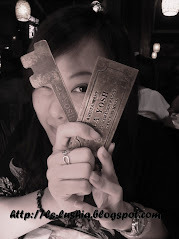 Restaurant Lock Tin prepares 30 types of delectable dishes everyday. 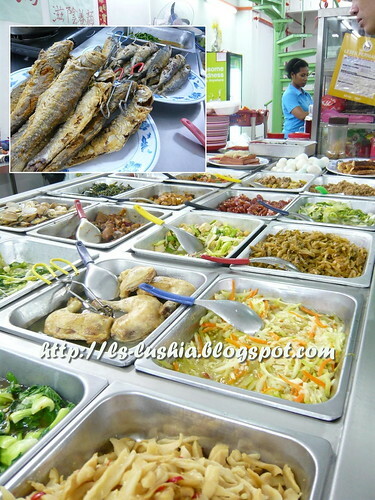 Dishes include vegetables, fish, meat and preserved food. All dishes are fresh and definitely not some leftovers. 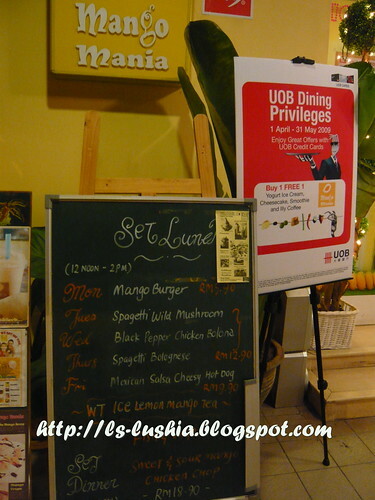 With that much of selection, one can hardly resist to dine in at Lock Tin. It's alright if you do not fancy porridge as they do serve rice as well and most important of all, the prices are reasonable compared to others. Some selection of dishes for dinner with a bowl of double boiled lotus root soup and yes, that means there are double boiled soups available too. My post doesn't end here and it continues with seafood theme. 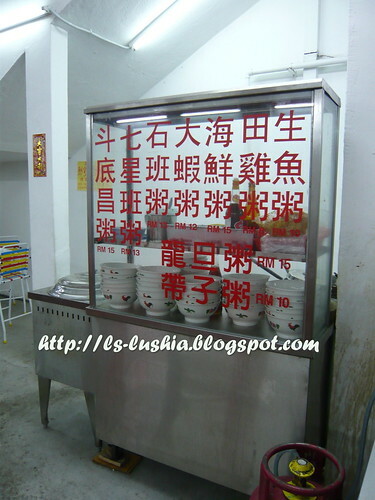 Also there are various type of seafood porridge serve by Lock Tin. Looks delicious but am yet to try! At Lock Tin, diners get a simple but perfect dining experience. It's a perfect stop over for a brief dinner where delicious, freshly prepared food to delight the palate. It has been a very busy week. A week where everything has to be quick. Quick lunch, quick dinner... quick quick quick! Hmpf! Anyway, I was craving for grilled chicken wings . And so, where else? 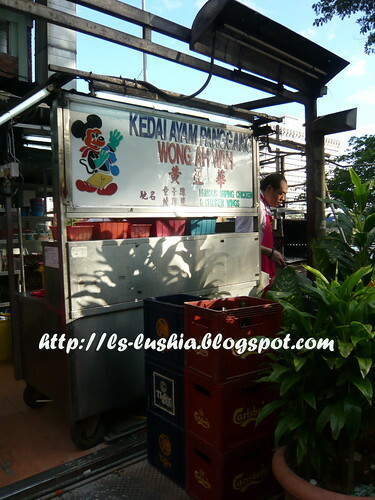 Of course Wong Ah Wah Chicken Wings 黄亚华 烧鸡翼@ Jalan Alor, KL! Had a quick and early dinner here but a real pleasant dinner especialy with the delicious chicken wings. 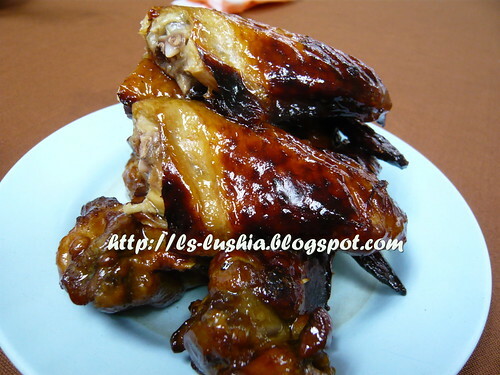 Famous over the years, Wong Ah Wah is sure to delight everyones taste buds with their delicious grilled chicken wings. 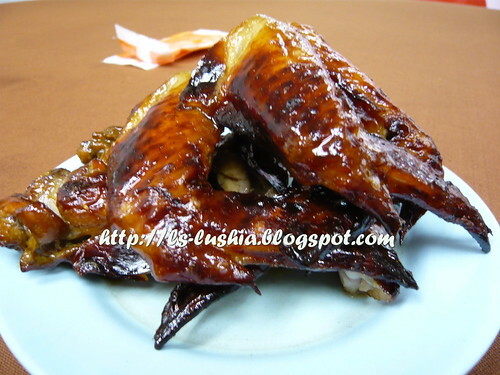 Perfectly marinated and expertly grilled, the outer layer of the chicken wings are grilled to crispy covering the succulent, juicy and tender chicken meat. Take a bite and you will agree with me- it's absolutely delightful! The roasted pork noodles tasted a bit different from what I have expected. 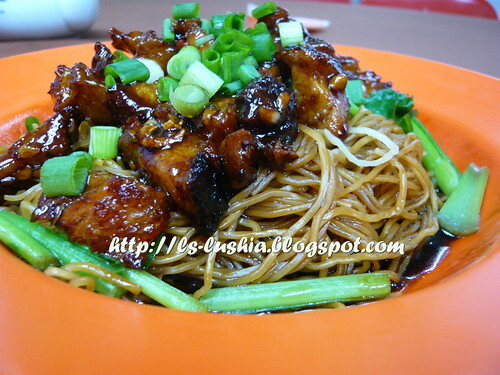 Don't get me wrong, it tasted good but I still prefer the roasted pork noodles by Seng Kee @ Petaling Street. Brings back some old memories to me. Grandma used to prepare this vegetable dish for lunch. Fried in a simple way and yet delicious. 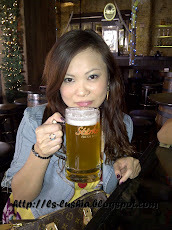 Thanks to the late Hong Kong comedian actress Lydia Shum for the song! 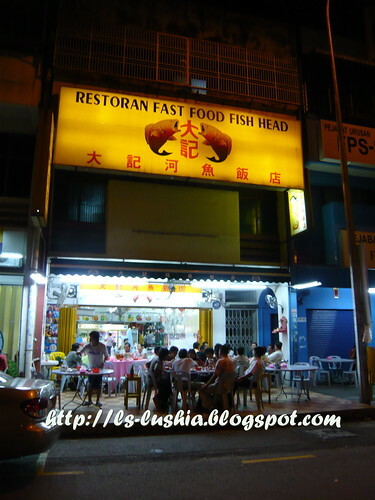 Restaurant Fast Foo Fish Head serves fresh water fish dishes as well as other seafood too. 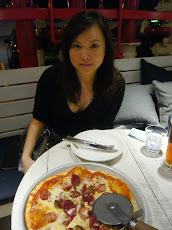 Although it's not a fast food chain restaurant, their service was good and the time taken to prepare our food was fast too! 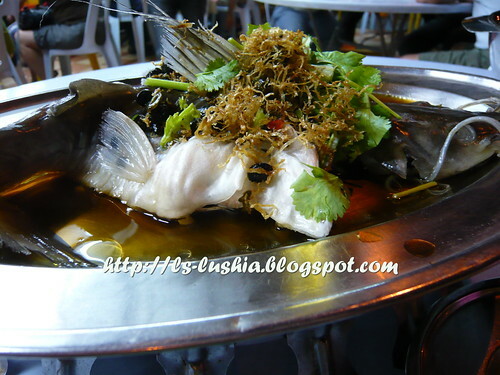 Steamed baung fish with fermented black beans and soy sauce topped with thin shredded fried ginger . Steamed fish with fermented black beans and ginger is their signature dish. Fish is fresh and not bony, steamed in a simple style but fulfilling in taste. It's a pleasant one! I love the deep fried squids with salt and pepper mix serve by this restaurant. Although it is a very common dish, most of the time the deep fried squids serve in some eateries are tasteless. 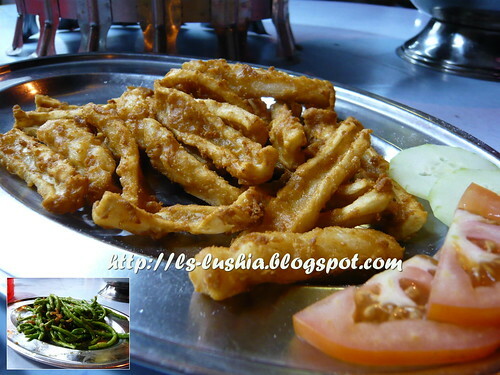 The deep fried squids serve here is soft with chewy effect, crispy and flavorful. 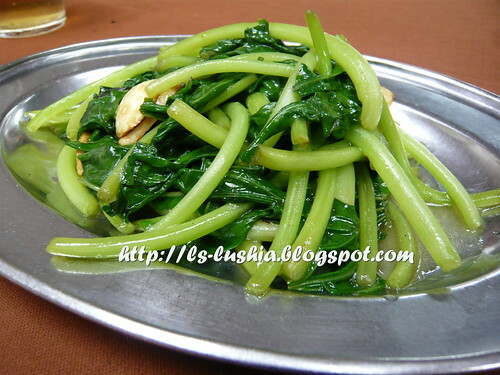 On top of that, we ordered another stir fried string beans with dried shrimps. Out of words to describe, taste wise- it's good! As I am done with my dinner, I looked around at the other tables... I see lots of tempting dishes here! And I said to myself- I WILL BE BACK! While looking for a restaurant for lunch in Pavilion, we came across Emperor Q. And I said, Look!! Look at the desserts displayed! 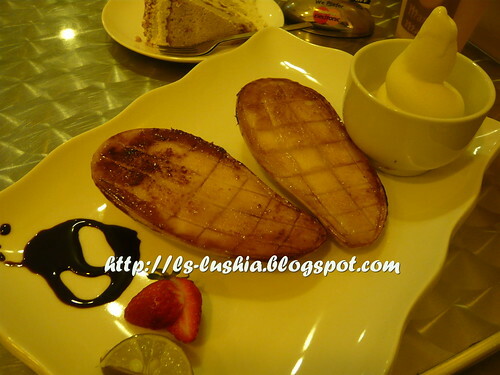 It's almost same as MOF Japanese Sweets & Coffee, the dessert house opposite Emperor Q! 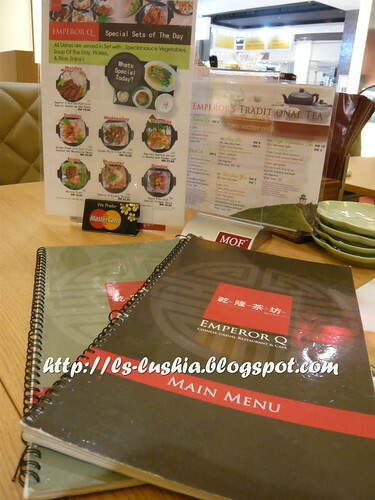 Out of curiosity, we decided to do lunch at Emperor Q. Then, I looked around and I saw Emperor Q by MOF!! 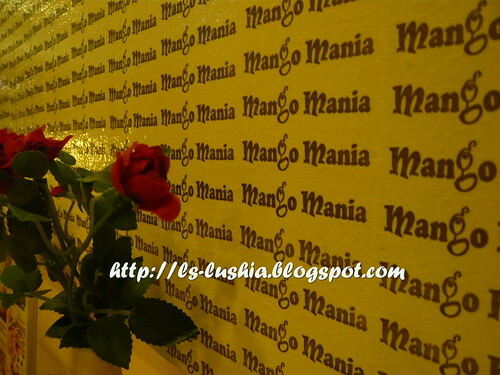 A well renovated restaurant that provides a perfect dining ambience. 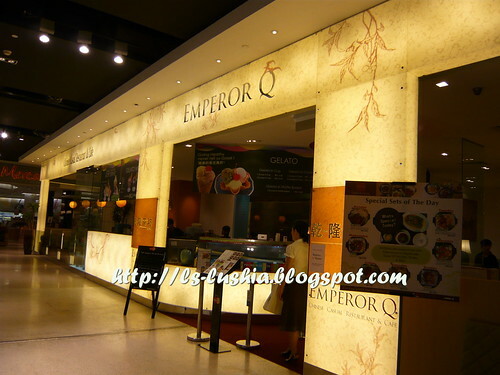 With their attractive menu and food display sets at the entrance of the restaurant, Emperor Q, invites everyone to feast like a Japanese/Chinese emperor! Click in to view their recent promo! The filling and toppings Emperor Q used to prepare the sushi and hand rolls are quite exclusive like char siew (BBQ pork) and roasted pork. If you are sushi lover, you might want try this out! It's tempting but we didn't order any . It's alright, there will always be a second visit! So what's for lunch? I am not so sure if this is vermicelli (mian xian) also known as longevity noodles, but, it is referred as 面线 (mian xian) in their menu. The noodles are not in thin strands but has a smooth texture. The noodles are served in a bowl of sweet yet not salty and slighly herbal tasted soup topped with fried small anchovies, and choy sum. With or without the fried chicken, my bowl of hot noodles is good enough and satisfy me much. The noodles are served cold. Obviously, I don't like food served cold (how about sushi?) but this is acceptable. Tried a small scoop, yeap! the noodles are cold but toasting the noodles with the minced pork sauce, the noodle dish has it's own outstanding character. You may top up only @ RM 2.00 for Emperor Q's signature steamed egg in cuo (Cawan Mushi). Emperor Q, passionately designed for the love of food, a restaurant where you will feast your senses on the treasure of Chinese and Japanese food and desserts. Desserts by MOF- must try! Citibank credit card holder:- From now until April 30 2009, spent at least RM 100 and above, and enjoy 20% discount at Emperor Q. 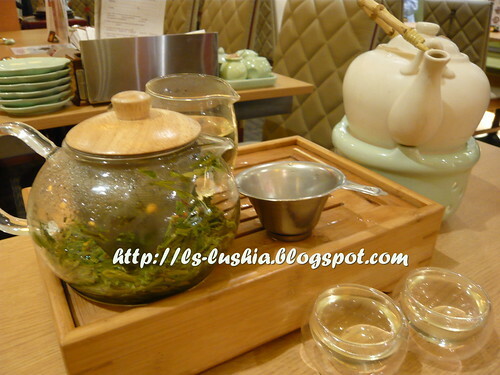 A complimentary pot of Chinese tea will also be served. Steamboat, Teppanyaki & BBQ has always been a famous dining style is East Asia. Especially steamboat -variety of dishes/ingredients served and then cook by the diners in a simmering pot of broth place in the middle of the table. 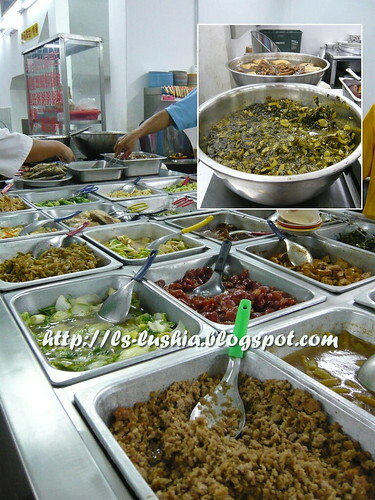 With that much of selection of ingredients, one can savor all kinds of food at one time. In most restaurant, steamboat are served with only a pot of broth and the table of diners share the pot of broth together. In 100° C Steamboat, Teppanyaki & BBQ Restaurant, each diner has it's own pot of broth. At each seating. there is a built in electrical steamboat pot and each diner can choose their preferred soup base. This Value set are for 1 person dining, there are several combination of value set ranging from 1 pax to 5 pax. There are side orders too. Besides steamboat set, teppanyaki and BBQ dishes available too! There are lots of choices and don't worry, you will find one that suits you. I love the fish ball filled with cheese- it's marvelous! What's the uniqueness of 100° C Steamboat, Teppanyaki & BBQ Restaurant? The first steamboat & bbq restaurant that provides delivery service. 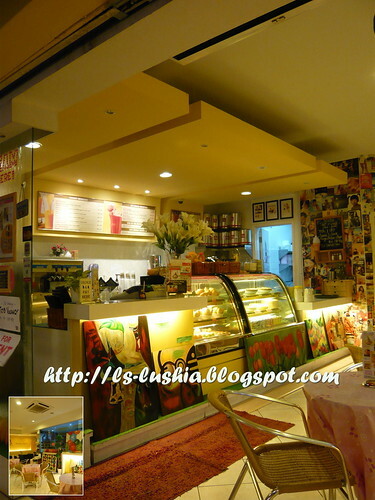 Fresh ingredients, varieties of food and a comfortable environment. What are you waiting for? It's definitely a good choice to dine in or a place to hold a gathering!